Peace Of Mind For Your Audience, In A Not So Secure World! 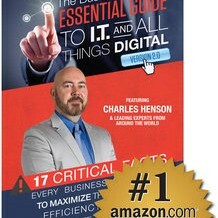 Charles recently became an Amazon #1 Best Selling Author on Cyber Crime. He is the host of an on-demand TV show called InSecurITy on Roku, Apple TV, Kindle and xBox systems. Charles is passionate about teaching Internet safety. Charles Henson, Managing Partner of Nashville Computer has been in the IT industry since 1991. He is an Amazon Best Selling Author and host an on-demand TV show titled "InSecurITy" where he helps educate people on how to stay safe, protect their money, business and their families from becoming the next victim online. Being in the IT industry for 25 years, Charles has been featured in the Redmond IT magazine regarding Backup Disaster Recovery solutions, and was invited to Google Headquarters in California for his personal feedback Google's product offering. Additionally he has been asked for his insight, invited to discussion groups and interviewed by peers and industry leaders to help build a common Cloud Computing Blueprint. Charles has become a trusted advisor to his clients, as well as business colleagues throughout the United States. Nashville Computer, Inc. is a locally owned IT company specializing in Peace of Mind IT Solutions. The company was started in 1988 as a software company providing organizations with MAS90 accounting applications. Today the company offers products and services to cover all of the IT needs of small to medium sized businesses, including overseeing the monitoring and maintenance of over 200 servers, Managed Services Programs, Cloud Computing, Hardware as a Service, Website Design and Hosting and much more. Find out more about Charles Henson at http://www.NashvilleComputer.com.